The Historic Chinatown Gate has been renovated several times since it was first built in 2008. These renovations have depleted maintenance funds for the gate, and now, ten years after it was built, supporters are considering fundraising options. Over the past 10 years, cleaning and painting the gate has cost $30,000, and new LED lights installed on it cost another $12,000, according to Tuck Eng, president of the Historic Chinatown Gate Foundation, a non-profit established in 1999 to build the gate and raise funds to maintain it. Eng believes another $30,000 needs to be raised over the next ten years for maintenance. Some type of maintenance is done every three to five years, said Eng, and the gate needs cleaning and painting in the next two to three years. The gate, located on South King Street, is unique among Chinatown gates in other cities in that the money for it was raised entirely through grants or private donations. One of the initial grants included $12,000 for maintenance, but those funds have since been used. Eng estimates that a community fundraiser could raise anywhere from $10,000 to $30,000 dollars. A 2010 fundraiser for seed money for a second gate on the other side of the neighborhood, and maintenance funds for the then-newly finished gate, brought in over $20,000 dollars. In total, the Foundation has $25,000 saved for the second Chinatown gate, Eng says. In 2015, Eng told Northwest Asian Weekly that the second gate would cost an estimated $800,000 to construct. That project is on hold until the funds are raised, a location can be found that’s acceptable to nearby property owners. 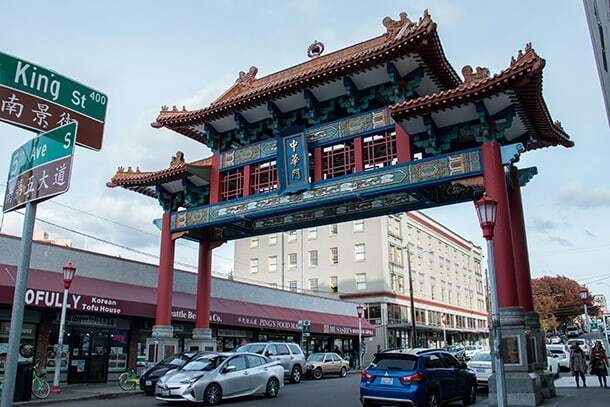 While the archway is maintained by the Historic Chinatown Gate Foundation, it is technically owned by the Chinatown International District Business Improvement Area (CIDBIA). At the time it was built, the City declared the non-profit Gate Foundation was “not mature enough,” said Eng. The CIDBIA, of which Eng is a board member, and the Foundation are hoping to more clearly outline their respective roles as the gate’s permit comes up for renewal, according to CIDBIA executive director Jessa Timmer. The 10-year public space management permit, the renewal of which may take several months to go through the city process, was first granted in 2008 with options for two renewals in 2018 and 2028. The CIDBIA recently received a notice from the city saying the annual cost of the permit will be raised slightly to approximately $1,400, Timmer said. Timmer was not surprised by the cost, given the rising costs of permits across Seattle, but she wished the gate could receive different treatment. The CIDBIA is also responsibility for covering the costs of liability insurance for the archway. The city requires that a $50,000 line of credit is held so that if the gate is not maintained in accordance with their standards, they can use those funds to tear down the gate. If this were to occur, the Foundation or the CIDBIA have the responsibility to bring the street back to how it looked prior to the 2008 construction, including repaving the sidewalk. Span Construction, a California-based company, donated steel for the project, which was designed by Paul Wu and Ming Zhang, and the Foundation used automotive lacryl paint that it thought was sturdier. Pigeon defecation has been an ongoing struggle to manage. The Historic Chinatown Gate Foundation hopes that the city will change the tear-down fund from the $50,000 that lies dormant into security bonds that would lower their annual costs, and open up the money for dealing with maintenance costs. The Foundation also wants to “gift” the gate to the city, but Timmer says there is no precedent for this, and it is highly unlikely. The foundation tried to donate the gate to the city, but it was not accepted because they would have built the structure differently had they owned it, according to Eng.